Having lived without a grill for the past two and a half years, I’ve come to enjoy broiling salmon almost as much as grilling it. I hope to post my favorite grilled salmon recipe here soon, complete with a great rub for fish- as soon as I figure out how to use the grill at our new place. This is simple and delicious. The sauce is tangy and fresh and compliments the fish perfectly, without adding a bunch of additional empty calories. Turn your broiler to high heat and place the top rack in your oven about 4-6 inches from the coils. Meanwhile, wash and pat the salmon plank dry; place on a plate and rub both sides with olive oil (about 1 tsp per side). Sprinkle with salt and pepper and brush the skinless side with the tablespoon of honey. If you don’t have a brush, you can spread it on with the back of a spoon. 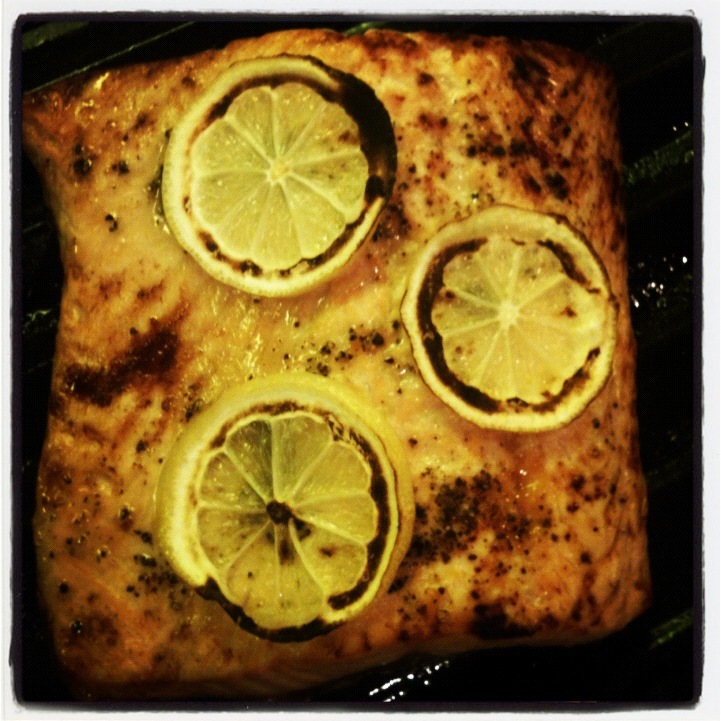 Slice the top third off of the lemon and cut 3-4 thin slices from it; arrange those on the salmon. Put the salmon on a broiler pan and pop in the oven. You should cook the salmon for 8-10 minutes, or until it’s cooked through and flakes easily with a fork. Testing the thickest part of the middle of the fish with s fork (even just pushing on it with the back of a fork) should give you an idea of how done it is. Too springy, and it probably needs to cook for a few more minutes. Keep an eye on it as it cooks, as all broilers are different and it may cook more quickly or smoke in your oven. 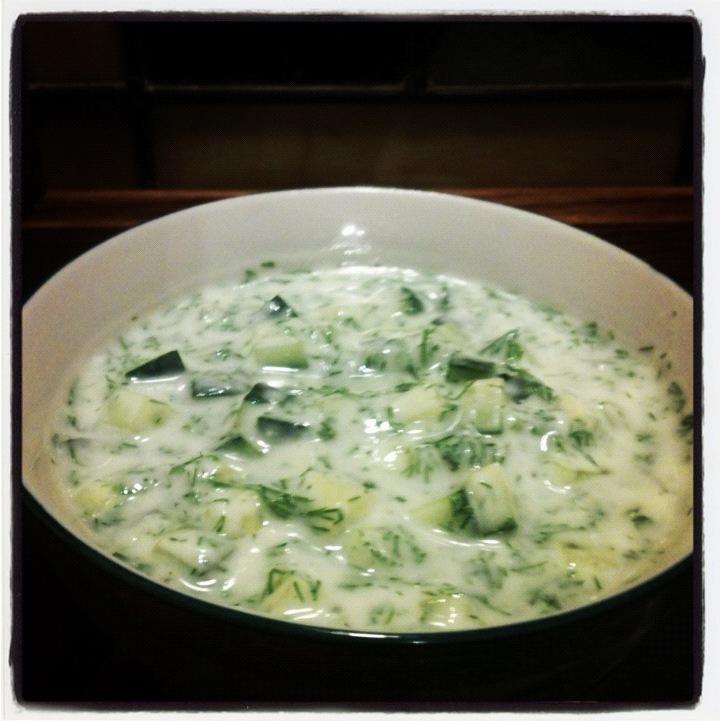 While the salmon is cooking, make the tzatziki sauce. Juice the remaining 2/3 of the lemon and place the juice in a medium bowl. Add the yogurt and whisk the two together until well-blended. Taste this and add salt, if you’d like. Finely chop the washed and dried fresh dill, and dice the cucumber. Add both to the lemony yogurt and mix. The salmon should be done by now, so take it our of the oven and let it rest for 5-10 minutes. Cut in two and serve with the sauce! We split a sweet potato and some steamed broccoli with olive oil on the side- it was a delicious, fast dinner on a beautiful spring night. This entry was posted in Dinner, Easy, Fast, Fish & Shellfish, Gluten free, Healthy Spin, Pescatarian, Sauces and tagged brolied salmon, easy salmon, salmon, salmon with lemon. Bookmark the permalink.